My user name is my ponysona (yay) Mirage. She is a unicorn - I decided she should be for my idea of talents to work. Mirage's coat is a lighter blue - but not sky blue, there is a slight hint of ..teal? (like G1 mirror mirror). Mirage has solid colored purple hair, closer to a warmer hue. I'm really into anime and japan, so mirage's hair is in a common Japanese style. Her eyes are golden, which really pop against her purple hair (yay for color theory class). Mirage's accessories are gold to compliment her eyes. I have always been very big on animals (I have 8 pets right now), especially dogs - I'm actually a dog groomer lol. 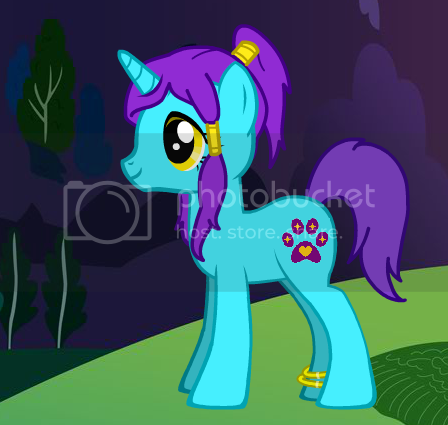 So Mirage's cutie mark is a paw-print, purple to go along with her hair. There is a heart of gold on the pad and a gold star on each toe. Her special talent - Mirage can take the form of some animals, haven't decided an exact list though, but not every animal under the sun either.